check it ooooouuuuut! 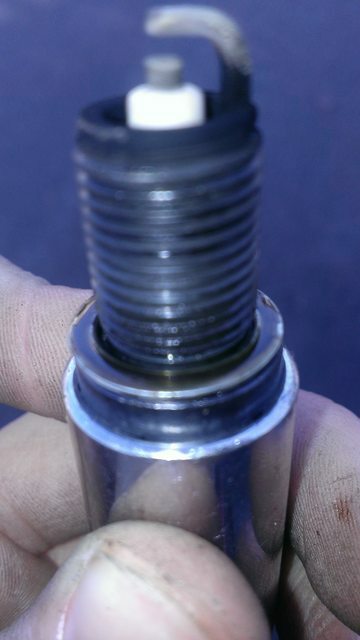 this is the cylinder 8 spark plug, the usual problem child. same blackness. brand new plugs, after 100 miles. now the misfire is barely noticeable and happens less frequently. not at idle anymore, which is good. start ups are reliable now. right? im running 1924's, and i initially assumed i had 23's (colder) and thought the same thing. here's the side of the ground strap. also, for future consideration, would you ever do an online tune of caledit? i know the logs are basically useless. but i was wondering none the less. yeah, exactly. forgot about the wot x fuel mult. (put to 1) leaned out the majority of startup, idle was stock rich too (.94). all leaned out. she's pretty peppy at the moment, even at startup, tip in and idle are very stable. i just wish i knew where the afr was at during wot. and how the hell are you supposed to read the logs? well yeah, but i get a horribly plotted graph. maybe i'm not seeing it right. do you have the latest caledit/calcon update? yep. it'll show ect correctly, and then everything else is a very small line at the bottom. it will only change the x-axis, which is time. which ruins the graph. i can't find a way to change the y-axis, which would be correct. went logging for a good long while; the car has somehow gone incredibly rich under all conditions (lambse of 17). was fine back then, not sure when it happened. i leaned it out again, fuel in CL is spot on. the misfire is still random, not always a big deal, sometimes the car bucks. and on top of that, engine oil is starting to disappear. good new: unplugged EGR and the misfire is GONE. completely. either it's open more than it should? or maybe afr heads can't handle as much. egr on with spark add off has the same effect, so the spark wasn't doing it. misfire is back. usually at low rpm's. ODDLY, only in drive. does drive idle air flow have an effect on this i wonder? because that was messed up.. it certainly dies easier in drive. i'll experiment..
found the oil leak, valve cover bolt were ALL loose. i could take them off with two fingers. tightened them, and now all that's left is the main seal. now that i'm logging spark, i noticed that spark stays at 25.75 at idle. goes up to 50 on the decel, jumps to 25.75, and just stays there. so no idle spark control. and i suddenly had a weird issue of caledit saying "bank count too big for current calibration. check and try again." or something along those lines. even reading the stock tune and writing that caused the error! i tried a bunch of different things and it randomly starting working again. i think it was the littler prayer i did that fixed it lol. it's also running lean on start up! why does it always do this! i need to grab a gas gauge. once it goes rich it stays rich though. jesus my car HATES the cold. or the fog. or me. putting numbers into the error filled spark idle neutral somehow fixed BOTH neutral and drive. so those are working. BUT it still goes lean on start up. i noticed your spark table on the a9l2 scales spark more going down in rpm than the stock D9S, (new table posted on the spark thread) so maybe that could be too advanced? would being too advanced down low cause, not audible pinging, but bucking/missing? if it doesn't fix it, i'll have to run through all the possible hardware. well she's done it now. the car doesnt want to start. on a recent drive through heavy fog it randomly start puking gas, while the hego's were still bouncing around, started bucking HARD, started halfway dying when the throttle was too low. wasted 5 gallons of gas trying to get it home. stopped at a gas station with not a single gallon left and died. codes 24 and 15- act out of range and KAM test failure. the engine light stayed on while driving, but was dimming with rpm's. i had plenty of coolant, oil, nothing fell off, nothing was obviously wrong. i managed to give it gas and crawl it home keeping it above 2k. smelt rich as hell but i remember the hegos were bouncing around fine drive before last. I'm going to give ME time to cool off before i even think of this car again. i might just leave it there and take a train back to sacramento to finish entering the air force. or i might drive it off a cliff. either way. mine did that a while ago and I found the vac line to the MAP kinked. have you looked into a faulty map? i was going to drive the car to a junkyard the next day to get a couple MAPs, among other things. the one good log i have of driving it to the station had the MAP showing normal readings, the only oddity is the ect is 214 when it's normally right under 200. Whats your ve vs ECT multiplier set at? Its not too high at higher temps is it? i only see a VE correction vs. ACT. Can't find one for ECT.. ACT admittedly gave a code reading for out of range, and in the log it started at 190 and moved down to 150 and switched between them frequently. at 150 it's 1, 180 it's 1.04, and 254 at 1.1875. 1.04 doesn't seem TOO bad, but ACT at 190 on a 40 degree night does. oh really? ACT isn't a big deal to replace. lil bit of thread lock, and bam. i'll pass word to my step dad, see if he wants to replace it and try to run the engine. i'm told he's run the car around the neighborhood. ACT was the culprit of course. i'll have to pick it up and make sure it's trip ready. i'll have to plan to give it a total tune up, all the necessary sensors will be replaced. what's your favorite brands? my thinking is that everything i havent touched is bad or will go bad as soon as i'm not expecting. like you say with the eec power relay (which i HAVE replaced, but there's still a few more up there.) it seems to me that everything that others fiddle with fail often. I'd feel a lot better knowing that this won't happen again, hours from home. well i gladly don't have a maf. but i had a failed map once, replaced with a random shop pile oem find. i have a new tfi from oreilly's, and the original ford back up with tools in the trunk. act is really that important? i never knew it was THAT big. and besides the act mult vs fuel and act retard, what else (in general) does it do? it would help fill in holes in my knowledge. sweetness. just got back to the car, and in celebration of it working (pretty damn well now) my friend and i rampaged through town setting off car alarms with our open exhaust. i was giddy. startup is a bit messy, but i think it's because i messed with ACT vs. OL fuel mult. but once it's warmed up it fantastic! timing cover coolant leak. pretty bad. got aaaall the way down to the chain and aaaall the way up. only cost me $40 for it all, so i saved 700 by not taking it to a shop. still, it's a PITA. taking the old oil/water mix to the closest parts store, and it dies in park. my new fuel pump relay bit the dust. order a warranty replacement, plug in the old eec relay to get me home, put the new FP relay in the next day. VE table is off at idle now, fixed that. oh hey, did not notice my lower rad. hose had fallen apart and was gushing. order that (one hour delivery, sweetness.) put that back on and fill up the radiator. and wait, what happens next? it drives perfectly. i mean perfect. starts up exactly like i ask it to. idles like i ask it to. cruises like it's brand new. no misfires, no water leaks, mpg seems like it's normal again, everything. It's. Finally. Happy. on a side note, is it fine to make engine brake decel's OL and a bit lean? for the burble sound. maybe like, 15 afr? it has adaptives off in that area as well, pointing to -20 per stock. shiiiiiiiiiiiiit no start. cranks, no spark. 12 volt to coil, 12 volt to inj positive wire, to ign switch, fuel and eec relay are good, changed tfi's to a known good one, change dizzy to a known good one. my last idea is ordering a computer. Help me out! it's stranded downtown. just list any ideas you can and i'll check them out. No maf... But I'll plug in the laptop to check the tfi. I dont have a fuel pressure gauge, but i jumped the pump circuit to make sure it runs.even if it didn't have fuel it would still spark though. I've unplugged all the sensors, one at a time, to see if theres a difference but no. Coil was switched to a known good as well. Nothing makes a least bit difference in it cranking. 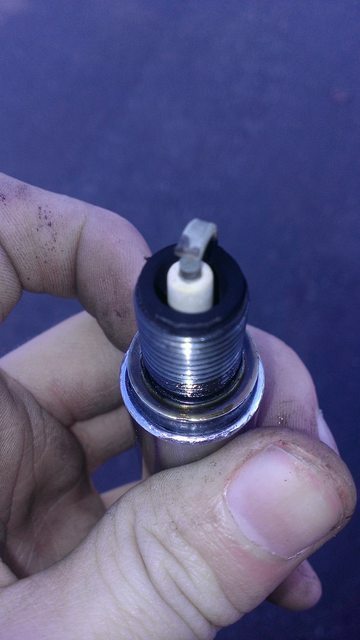 Bad coil wire to center of dist cap or bad cap/rotor? Something was adjusted in the tune lately?